Blazers are an ultimate wardrobe staple piece for any occasion. Featuring a beige material with a 3/4 sleeves and a loose fit. Style this with cycling shorts or high waisted trousers and sky-high heels for a look we are obsessing over. Blazers are an ultimate wardrobe staple piece for any occasion. Featuring a beige material with a 3/4 sleeves and a loose fit. Style this with cycling shorts or high waisted trousers and sky-high heels for a look we are obsessing over. We are seriously obsessing over this must-have blazer. Featuring a white snake print fabric with 3/4 sleeves and wrap over blazer style, you can't go wrong. Style with killer heels and statement jewellery for a look we're obsessing over! Work prints into your date night wardrobe with this super cute co-ord blazer. 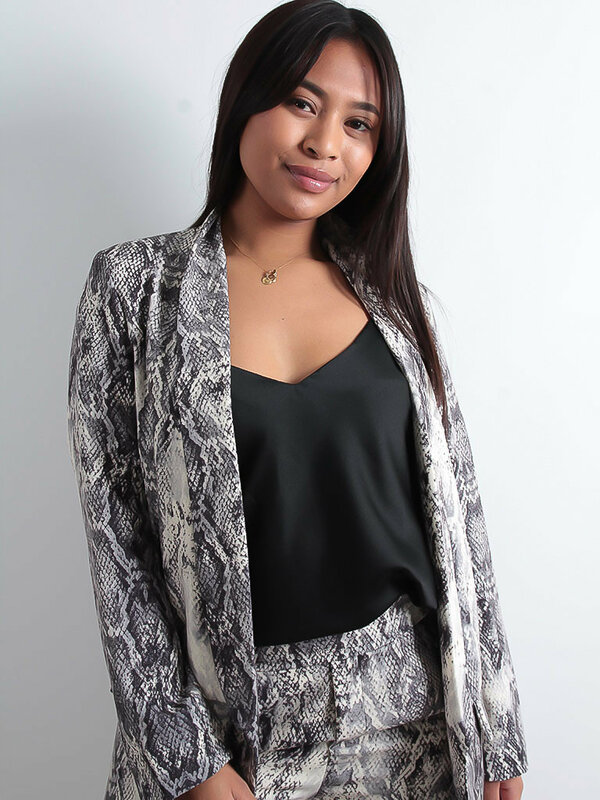 Featuring a grey snake print material in a longline fit with shoulder padding, style with the matching bottoms and complete the look with a crop top and heels. This blazer dress will give you a fierce look with full of attitude. Featuring a classic black fabric with an asymmetric design and silver button detailing, style with statement accessories and killer heels for a chic weekend vibe! Channel some serious amounts of class with this insanely cute blazer jacket. Featuring a crisp white fabric with 3/4 sleeves, and front pocket detailing, style with a pendant necklace and high heels to complete the look! Slogan tees are a must buy this season and we are obsessing over this simple style. Featuring a white fabric with ' Rebel' logo on the front and a relaxed fit. Team it with a pleated skirt and blazer for sporty chic vibes!